From 1920, the population of Los Angeles more than doubled in a decade as Americans discovered a city made rich by citrus farms, oil, and Hollywood. New developments - Bel-Air, Beverly Hills, and Holmby Hills - offered house buyers ocean view lots only twenty minutes from downtown along recently completed Wilshire Boulevard. The Los Angeles tradition of architectural innovation and unimagined luxuries: private air fields, golf courses, beaches and water gardens - continued with revivalist and modern residential designs evolving simultaneously. Gordon B. Kaufmann, Wallace Neff, and Roland E. Coate developed the contemporary Mediterranean villa and California adobe as Lloyd Wright, Rudolph Schindler and Richard Neutra explored modernist plans and building techniques, establishing Los Angeles as the centre of American modernism. 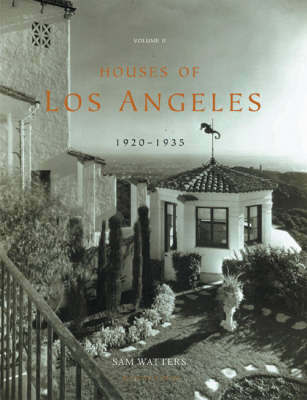 "Los Angeles Houses, 1920-1935" is the sequel to "Los Angeles Houses, 1885-1919". This volume brings together for the first time house and garden plans with over three hundred archival duotone photographs of downtown residences and mountainside estate houses, built by Hollywood celebrities and Los Angeles innovators.